Women on a Mission: Mom Edition: Nothing, except Hangovers. This post is about nothing. I, literally, have nothing new to tell you today. 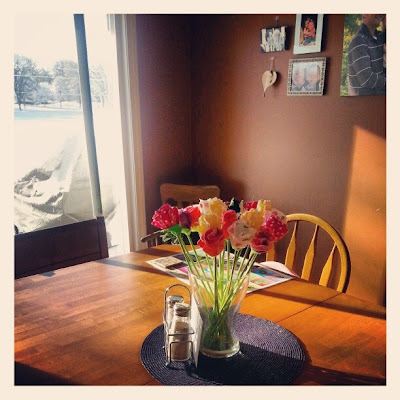 This is my kitchen table this morning - my spring flowers with snow outside! Disgusting. I haven’t been cooking any new recipes. I haven’t made any new crafts. I am uninspired. I tried to go to a fairy gardening seminar two Saturdays ago but the girls were so naughty that we had to leave before I learned anything. But even still, I’m normally chomping at the bit to get into the greenhouses to buy my plants and this year it hasn’t crossed my mind. To really get the point across, here’s just how dangerous this is – I texted the following to Lori the other day: “Is it just me or do u hardly care about Jodi Arias anymore?” I know, right?! True, we’ll riot if she gets off, but with the combination of this winter and her trial taking.too.effing.long, I could just about care less. Anyway, I hope you all have a really nice Wednesday. Pray for some spring weather for MN so I can get my sassypants attitude back. I am totally ready to start rolling my eyes at stuff (and wearing bronzer) again.